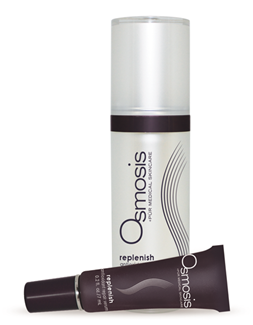 Replenish by Osmosis Skin Care is an age reversing alternative to Vitamin A.
I love this serum and have been using it for years! Especially great for keeping the skin resilient and dewey looking in the dry winters. I love Osmosis, have used it for years! Aqua (Harmonized Water), Phosphatidylcholine, Glycerin, Niacinamide, Alcohol Denat., Chlorella Vulgaris Extract, Palmitoyl Tripeptide-38, Polyglyceryl-4 Caprate, Pyridoxine HCl, Panthenol (D), Lactic Acid (L), Fulvic Acid, Beta-Glucan (D), Thioctic (R-lipoic) Acid, Ubiquinone (CoQ10), Glutathione (L), Ergothioneine (L), Astaxanthin, Polygonum Cuspidatum (Giant Knotweed) Extract, Tocopherol (D-alpha), Camellia Oleifera (Green Tea) Leaf Extract, Ginkgo Biloba Leaf Extract, Olea Europaea (Olive) Leaf Extract, Vitis Vinifera (Grape) Seed Extract, Citrus Grandis (Grapefruit) Peel Oil, Citrus Limon (Lemon) Peel Oil, Santalum Austrocaledonicum (Sandalwood) Wood Oil, Glycine Soja (Soybean) Oil, Lonicera Caprifolium (Honeysuckle) Flower Extract, Lonicera Japonica (Honeysuckle) Flower Extract, Caprylic/Capric Triglyceride, Xanthan Gum, Benzyl Alcohol, Hydroxypropyl Cyclodextrin, Polysorbate 20.